Journaling is an inherent feature of OS/400 on the iSeries that has been around since the early releases of the System/38. The system employs journals to ensure data integrity and recoverability and this support can further be extended to reduce the duration of an abnormal system end. Journaling also serves as the cornerstone upon which many data replication and data warehouse refresh schemes are built. 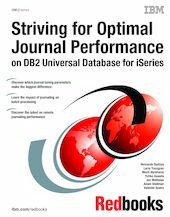 The aim of this IBM Redbooks publication is to provide you with an understanding of the factors which influence journal performance on the iSeries and to help you identify which hardware options and software settings you can employ to minimize this impact. We will also share with you some ideas on how to minimize the impact of journaling on your iSeries from an application point of view. We also explain the remote journal function on the OS/400, which offers a reliable and fast method to transfer journal entries to a remote iSeries server. We performed tests concerning remote journal performance and tested this function in different environments.